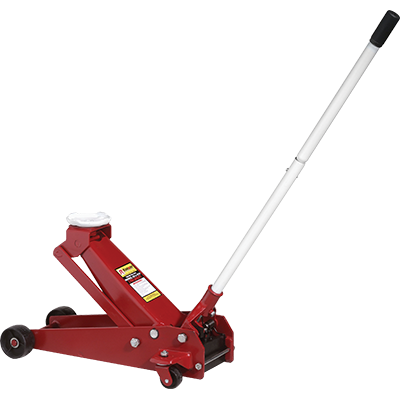 The RFJ-3TP 3-ton professional series garage floor jack is perfectly suited for the auto shop or your home garage. Just over 19” of lift makes this a remarkably fast-lifting jack that’s perfect for fast-moving shops and private users that want a commercial-grade jack in the comfort of home. The RFJ-3TP is a versatile lifting machine designed to meet a variety of everyday duties. Capable of handling a full 6,000-lb. load, this trusty floor jack is made out of heavy-gauge steel to ensure maximum durability under tremendous pressure. As with every Ranger floor jack, the RFJ-3TP exceeds all ANSI standards in performance and safety. Lowering this jack is as easy as twisting the handle, thus activating a small gear that controls a pressure value; as pressure is released, the floor jack gently lowers with no effort from the user. With overload protection and a fully sealed hydraulic system to prevent contamination, the lift mechanism requires virtually zero maintenance over its lifetime. This jack is designed to handle most residential vehicles, including light trucks and SUVs. With a 5.25” in collapsed profile, this isn’t one of our super-low-profile models, but it is ideal for average sedan heights and heavier-duty vehicle types. It’s also exceptional lightweight, so you get an incredible power-to-weight ratio that surely explains why this floor jack is a staple in garages worldwide. While there are plenty of floor jacks on the market, when you buy with us, you’re investing in the same, painstakingly over-engineered and ruggedly constructed components found on our car lifts. This quality is evident even on our light-duty jacks. For a better, safer lift, trust in Ranger, the name that has earned its reputation as the best floor jack and automotive service equipment provider worldwide. Ranger insists you always set jack stands under your vehicle after jacking up the car, so be sure to use the right stand for the weight of your vehicle.